U.S. Sen. Ted Cruz has been an ardent and highly visible opponent of giving undocumented immigrants a way to become U.S. citizens. He is advocating a middle ground — legalization and more visas without citizenship. When it comes to immigration reform, U.S. Sen. Ted Cruz has made it abundantly clear what he opposes: giving citizenship to people who broke the law to come here. What has not been as evident is what he supports: legal status for millions of people here already, while making it easier for immigrants to come here through the front door. But for Cruz, a Tea Party favorite who represents a state with rapidly changing demographics, finding common ground will not be easy. Many of the bedrock Tea Party supporters who helped elect him are immigration hard-liners who object to even the slightest nod toward amnesty, a loaded word that generally means providing an avenue for legal residency to people who entered the United States illegally. Such conservatives tend to favor mass deportation, or “self-deportation,” for the millions of undocumented immigrants. On the other hand, Hispanics in Texas are projected to eclipse the white population sometime in the next decade, and Cruz cannot afford to alienate large numbers of Latino voters with a strident anti-immigrant tone and a hard-line legislative approach. Major business interests also are supporting a path to citizenship. What Cruz has tried to articulate in both word and deed is a middle ground. It got no support from Democrats in Washington, but it goes further than many on the far right want to go by offering leniency to undocumented immigrants here already: A path to legal status, but not to citizenship. A green card with no right to naturalization. Immigration-reform legislation from the Senate’s so-called Gang of Eight passed that chamber in June and includes a 13-year path to citizenship. Cruz pushed unsuccessfully for amendments that would have, among other things, eliminated the citizenship component. “The amendment that I introduced removed the path to citizenship, but it did not change the underlying work permit from the Gang of Eight,” he said during a recent visit to El Paso. Cruz also noted that he had not called for deportation or, as Mitt Romney famously advocated, self-deportation. Cruz said recent polling indicated that people outside Washington support some reform, including legal status without citizenship. He said he was against naturalization because it rewarded lawbreakers and was unfair to legal immigrants. It also perpetuates illegal crossings, he added. Besides barring citizenship while instituting some level of legalization for those here already, Cruz has proposed increasing the number of green cards awarded annually, to 1.35 million from 675,000. He also wants to eliminate the per-country limit that he said left applicants from countries like Mexico, China and India hamstrung when they tried to gain legal entry to this country. Cruz said the Obama administration and partisan Democrats would not yield on the citizenship requirement, which they know would kill the entire effort because of a lack of support in the House. The result, he said, will be a future campaign tool by which Democrats can blame Republicans for failing to overhaul immigration. 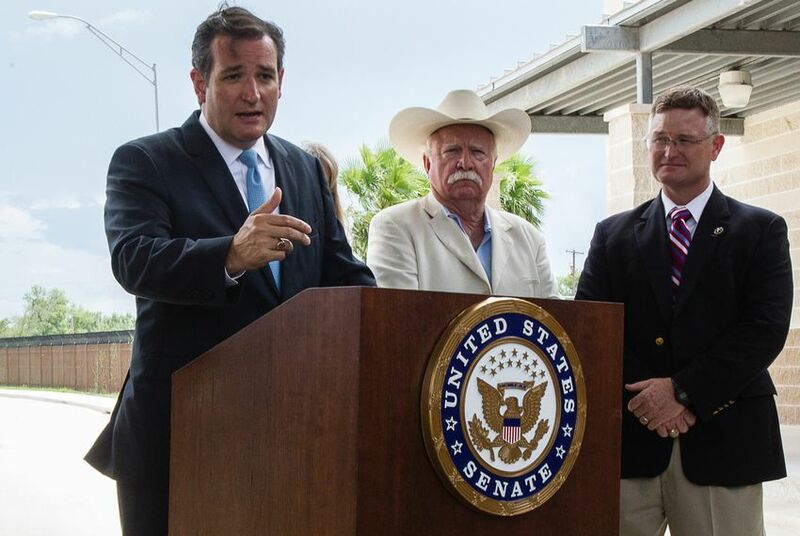 Democrats say that Cruz is not in line with what most Americans favor. On that score, he finds himself out of step with hard-liners who do not believe immigrant laborers are needed. Ira Mehlman, a national spokesman for the Federation for American Immigration Reform, which advocates increased border security and limited immigration, opposes expanding the pool of legal workers the way Cruz proposes. And citizenship or not, he added, legal status still means immigrants take resources from citizens already here. "We’re also opposed to the expansion of guest-worker programs,” he said. “There is no evidence of a worker shortage." Cruz routinely cites his own history as inspiration for his views on immigration. His father, Rafael Cruz, a North Texas pastor and Tea Party favorite in his own right, fled Cuba and worked as a dishwasher before attending the University of Texas at Austin on a student visa, and he is now “living the American dream,” Ted Cruz says. But critics of Cruz argue that Cubans are awarded what some today would call amnesty. Federal law allows Cubans to adjust their legal status a year after arriving. Cruz said American refugee law had always been sympathetic to those in his father’s situation, even before Fidel Castro took hold of the island. Cuba poses a different scenario from other countries, he said, because U.S. immigration law has recognized for decades that there is a qualitative difference between fleeing political persecution and fleeing poverty. Mexico, he said, is a great country, although its drug violence and poverty are horrific, and Mexicans with a credible fear of persecution should apply for asylum. But the problem is not as widespread there, he said.